Huge congratulations to Francesca and Greg who were married at Old Brook Barn, Navestock on Saturday 25th July. They chose a tower of mini wedding cakes with a two tier cutting cake. The flavours of the mini cakes were dark chocolate and lovely lemony lemon cakes, whilst the cutting cake was a Madagascan vanilla sponge on the bottom tier and carrot and pecan for the top tier. A really lovely mixture of flavours for their guests! 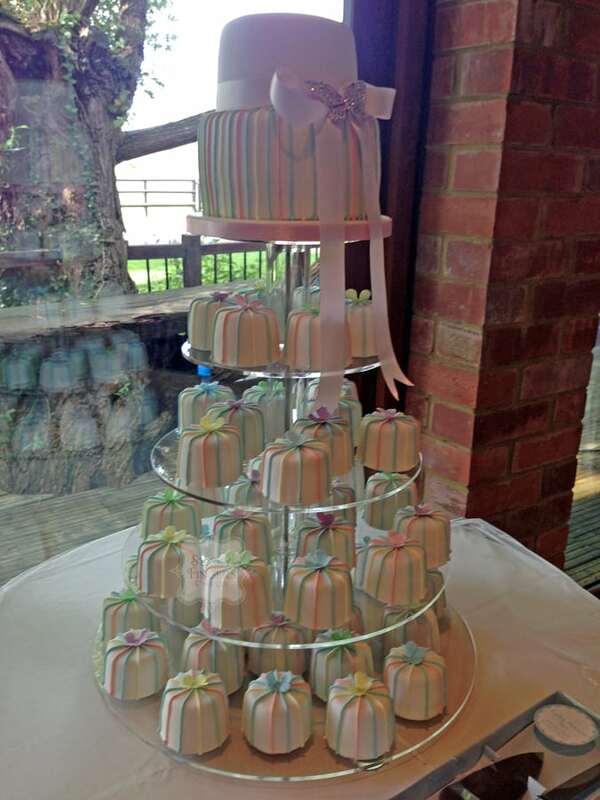 All the cakes were decorated with pretty pastel candy stripe piping with the mini cakes topped with a sugar butterfly. Francesca and Greg had the barn decorated in pastel pink, blue, green, lemon, peach and lilac. They also had jars of old fashioned sweets on the tables, marshmallows, flyingsaucers etc. It looked amazing! I hope you had a truly wonderful day..